Every Monday morning (in your local timezone!) 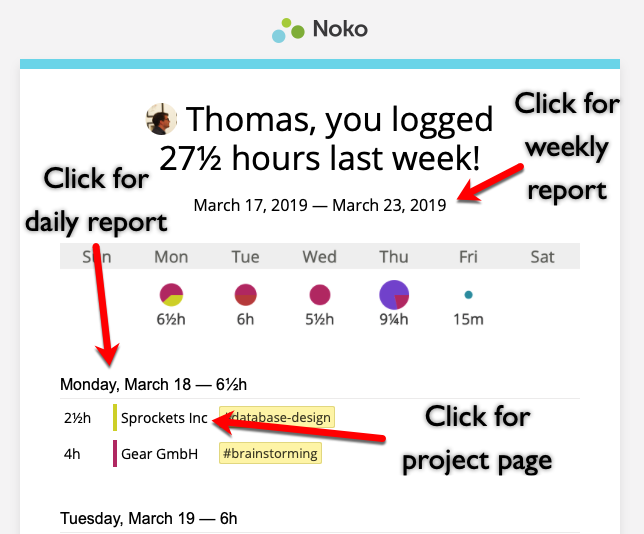 Noko will send you a weekly activity report showing everything you've logged for the previous week. If you're a Supervisor we'll also send you a weekly report of all time logged the previous week by the entire team. Weekly reports are chalk full of information but they're not long and boring! 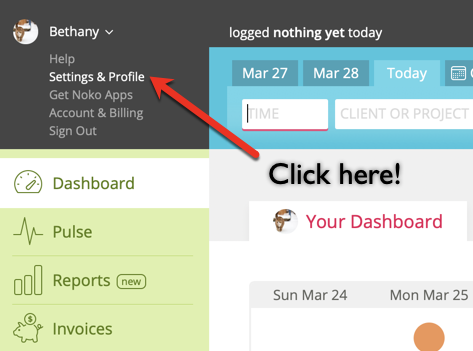 Throughout the email, you can click on links that'll take you to your Noko account so you can review and edit your time. We try to keep the weekly report emails short and sweet. You might not see all of your time if you or your team worked like crazy the previous week. Instead, we'll show you a summary of your work for that week and entries logged at the beginning of the week. 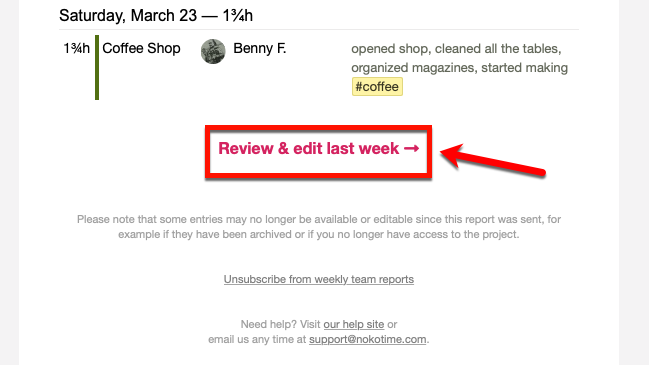 We've also included a Review & edit last week button at the bottom of the report. So you can see the full report and make changes where necessary. 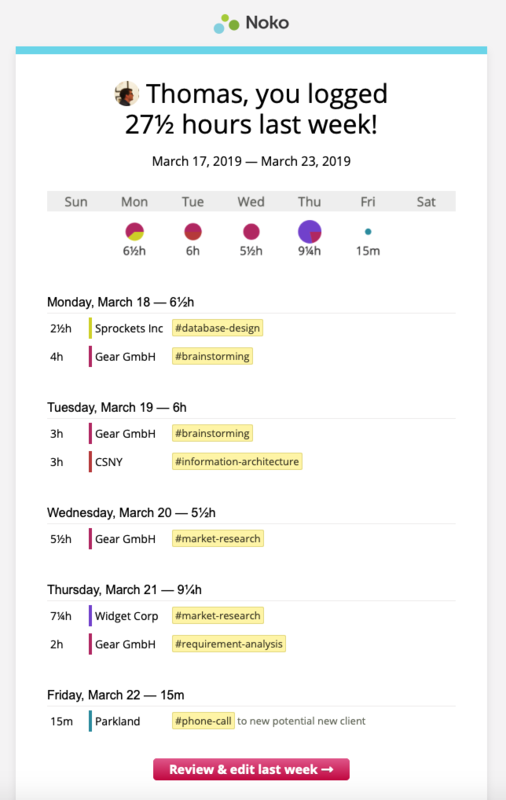 You can unsubscribe to any of these weekly reports within the email itself, or you can edit your report preferences in the Notifications tab in your personal settings. Additionally, within the email is a link to unsubscribe from these reports if they're empty, as long as they stay empty (this is handy when you go on vacation!). Go to Settings & Profile in your Account & Settings menu (that's the little pop-up window that appears when you mouse over your Noko avatar). 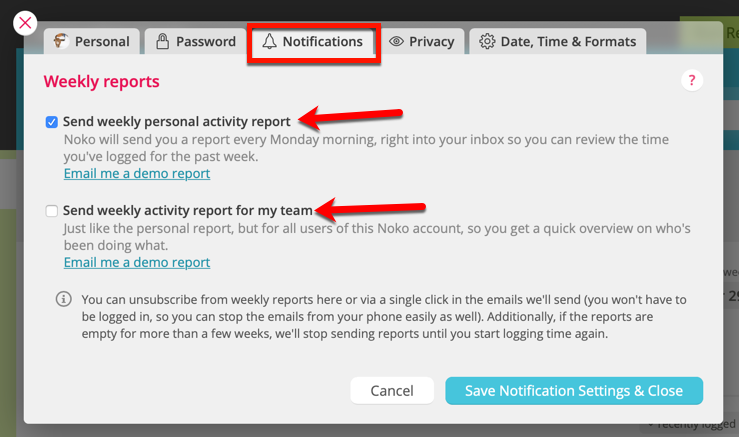 Choose which reports you want to receive and then click Save Notification Settings & Close. 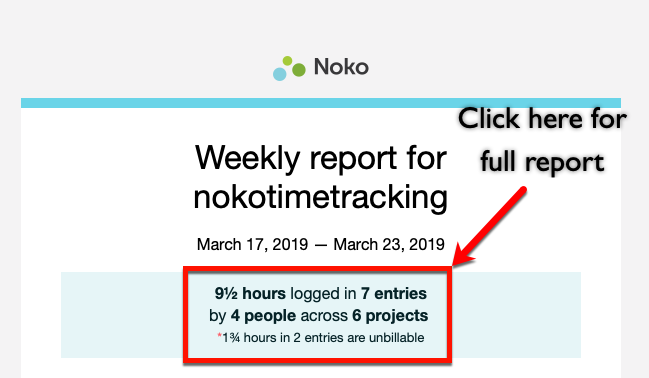 Also, if you haven't logged time for a while, Noko will automatically stop sending you weekly report emails.